Vikram is busy with the shooting of his science fiction thriller Iru Mugan and the makers of his next project Garuda have already started the composing work. 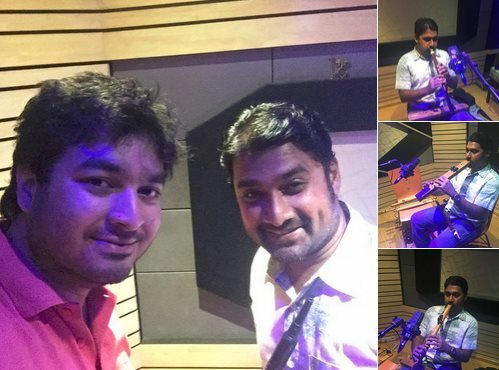 “Done wit Composing the 1st track for #Garuda & quite impressed wit @girinandh work..Recording starts from tomorrow,” posted director Thiru on his Twitter page yesterday. We learn that Director Thiru and music composer Girinandh are planning something different for the introdution song of Vikram in their upcoming film ‘Garuda’. “It will have influences of world music. We have already started instrumentation and live recording,” says the music composer, who is happy about working for a Vikram-starrer. Stating that plans are on to make Vijay Prakash to sing the number, Girinandh says the song will be totally different and will impress the audience. “We are of the hope that it will break barriers of conventional music. It will be a peppy song, but certainly not a kuthu number. But it will have loads of energy,” he adds. Produced by Silverline Film Factory, Garuda stars Kajal Aggarwal as the female lead. The first schedule will kickstart soon in Sriperumbudur where the team has erected lavish sets in a 100-acre land. Pollachi, Coimbatore, Ahmedabad, Lucknow and few countries in the middle east have been zeroed in as shooting locations for the film. Mahesh Manjrekar of Arrambam fame plays the baddie.